Southland’s Image Boats is revisiting the prospect of developing a range of smaller, more affordable boats and will test the market with the debut of its new 6.4m Elite hardtop. Steve Raea slips behind the wheel. As a custom builder of predominantly 8m-plus trailer boats, Invercargill's Image Boats has been reluctant to diversify into smaller craft, choosing to concentrate almost exclusively on its proven blue water Fishmaster range. But this comes at the cost of having little or no presence in a large sector of the trailer boat market, where smaller boats equate to greater affordability and the likelihood of more boat orders passing across the factory floor. Economies of scale can't be ignored but diversification can be a doubled-edged sword. The greatest risk for Image Boats in expanding its range is a potential watering down of the brand's reputation as a specialist custom boat builder. This is something Image Boats founder and builder Dean Wilkes has weighed up carefully in reaching a decision to build a range of smaller boats that will essentially be scaled-down versions of his current Fishmaster fleet. Branded as Image Elite, these boats will be pitched at buyers looking for solid no-nonsense fishing boats that share many of the design attributes of the Fishmaster. Downsizing is not completely new territory for Wilkes, who three year ago released a demonstration 5.8m Elite cuddy and a 6m Elite hardtop. However neither model really took off because of competing time commitments and a lack of marketing support. Both models received favourable reviews on their debut but without the support and promotion of an established dealer network, getting the new models in front of customers was a challenge. As a result the Elite series struggled to gain any real traction. As a sole operator, Wilkes says bringing dealers on board to share the load will be critical to the success of the Elite series, and says he's keen to discuss opportunities with established dealer networks in the North and South Islands. Building on his previous Elite releases, Wilkes has unveiled his new Image Elite 6.4m hardtop: a model that captures the essence of the Image Fishmaster with the trademark Image extended boarding platform and enclosed hardtop. While lacking the aesthetics of the larger Fishmaster, the new Elite 6.4 is very much a dedicated fishing platform and it is built tough for extended coastal and offshore fishing duties. 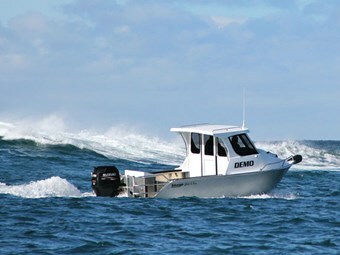 Aptly named Demo, the boat is best described as simple and functional. The Elite's half-cuddy is set low into the V of the hull to maximise sitting headroom and increase cabin volume, but the twin upholstered squabs, at just 1.1m, are well short of a length and aren't an option for accommodation. There's nothing by way of enclosed storage either, but being an enclosed hardtop this is neither here nor there. The absence of a structural cabin bulkhead other than the folded aluminium instrument and wheel fascia further opens the interior of the boat and lends a spacious feel to what in reality is not a large space. The driver and passengers seats are set atop welded aluminium stowage boxes flush-mounted against the internal aft bulkhead wall. With its large windscreen, opening side windows and rear windows, there is an abundance of natural light and excellent visibility around the boat from the helm station. The large rectangular foredeck hatch is folded aluminium and provides easy reach-over access to the Elite's enclosed anchor locker, which is positioned immediately aft of the over-sized anchor fairlead. The business end of this boat is the cockpit which takes its design cue from the larger Image Fishmaster with the same extended boarding platform. This effectively creates a lot more usable space out back. It's also the ideal arrangement for divers and it's here that the Elite differs noticeably from other boats in this class. There are few 6.4m trailer boats that will comfortably fish six, but the Elite 6.4 does, and it does it without any compromise or trade-off. While the boarding platform lacks the weather protection of the cockpit proper, it's certainly safe and sure-footed with checker-plate floor and large wrap-around aluminium rail. The inclusion of a single welded rod holder on each aft corner will be useful given that this demonstration model has not been fitted with an overhead rocket launcher. The cockpit and transom meet at a solid raised bridge deck with step-thru on both the port and starboard sides. When underway, the step-thru is secured with a pair of alloy hatch boards that locate into slides. 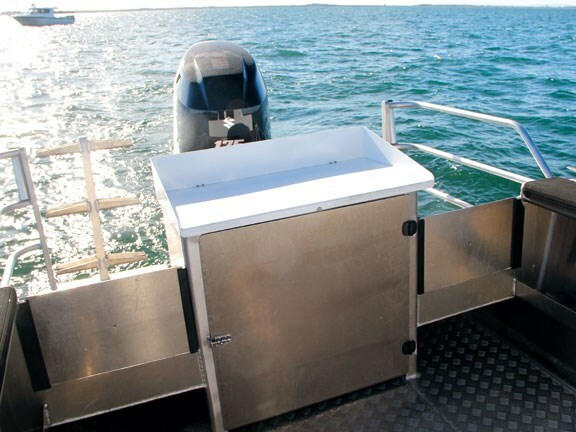 The Elite's central bait station is a scaled down version of the Fishmaster and is equipped with the same oversize aluminium bait tray set on top of the boat's battery storage rack. A large hinged door makes easy work of accessing the batteries, battery isolation switches and bilge pump and plumbing. It also has ample reserve space for the installation of optional wash down and/or live bait tank plumbing. The cockpit combings are wide and fitted with non-skid rubber for a comfortable seat when fishing at rest. There is a pair of rod holders each side and a solid aluminium cockpit shelf for gaff, nets, fenders and general fishing items. 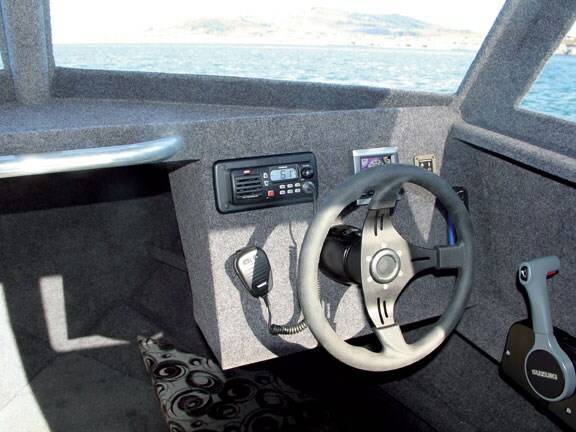 The checker-plate cockpit sole is solid underfoot with the boat's 160-litre under floor fuel tank centrally located to aid stability and trim. There's no under-floor fish bin on this model, with all available space being pressed into service as reserve buoyancy. Construction detail follows closely that of the Fishmaster, with a solid triangular internal cross section formed by fully-welded keel bar, full-length bearers and seam-welded transverse stringers ensuring a rigid hull on which to build up from. The hull from keel to chine is fabricated from 5mm plate while the topsides, cabin top and decks utilise a mix of 3mm and 4mm plate, all from 5083 marine-grade alloy. The cockpit sole is 4mm tread-plate alloy seam-welded and pressure tested. Almost every fitting has been fabricated and welded to the boat, including bollards, rails, anchor fairlead and boarding ladder, and as such there's very little to break or vibrate loose. Maintenance should be limited to mechanical running gear. The boat also feels solid underway without any annoying creaks or squeaks from bolt-on accessories. Passage from the cockpit to the bow could be a little challenging in a seaway, but there are welded handrails on the hard top roof and a half-length bow rail (although it's too low to be of much assistance going forward). This shouldn't, however, be necessary. Making the most of a recent visit to Bluff, Trade-A-Boat tested the new Elite 6.4m in the company of the much larger Image 8.5m Fishmaster and the recently released Stabicraft 1850 Supercab. Having both a bigger and smaller boat was ideal for comparison purposes. Conditions on the day were challenging and changeable, with wind-against-tide kicking up an awkward chop. The confluence of a strong current flowing around the bottom of the South Island spiced things up accordingly, creating steep breaking waves: just the melting pot for which the boat has been designed. Fitted with a 175hp four-stroke Suzuki, the Elite had ample power on tap which was a Godsend because, as the pictures attest, pace and manoeuvrability are your best defence when you're up against the unpredictability of Anchor Ridge. While we don't encourage boaties to push their luck at sea, dodging and darting seas across the ridge was certainly a test of the boat's agility and ability to pull itself out of the hole smartly and get cracking, and in aerated water with precious little grip. Rated at the top end of the horsepower range for the 6.4m, the Suzuki's big propeller had awesome bite on the water and was reassuring with waves building like Mt Vesuvius around us as we hung in, waiting for the perfect shot. Inside the 6.4m hardtop, life was Zen-like; deceptively calm and quiet and without a hint of engine noise or vibration from the big Suzuki bolted out back. Back into deeper water and traveling at speed, the Elite would have benefited from trim tabs, leaning into the fresh breeze and occasionally surfing off by the bow when landing into the back of a swell. But with throttle on, the Elite recovered quickly, powering onto an even keel ready for the next assault. With more pot holes than a Far North highway, the Elite 6.4 saw plenty of air – and spray – but the deep forefoot did a good job of absorbing the knocks, while the variable chine kept the worst of the wash out of the cockpit. In tough conditions like these any boat is going to be wet and we saw our share of wind-blown spray find its way back into the cockpit, but up front with the cabin door closed it was dry and warm. Standing with both feet firmly plastered to the floor is the only way to go in the rough and there was plenty to hold onto. The seating, however, is less secure and it was a stretch to find an adequate foot brace. As the first of the new design off the floor there's plenty of room to tweak and improve, but in stock-standard form as reviewed, the boat lives up to its promise as a capable well balanced boat with the wherewithal to go out wide in safety and relative comfort. I'd like to see more over-hang off the back of the hardtop to increase cockpit protection, along with a drain or diversion to channel water from the hardtop roof back into the sea rather than into the cockpit. A bimini top similar to that fitted to the Image Fishmaster would work here and it is no doubt an option. 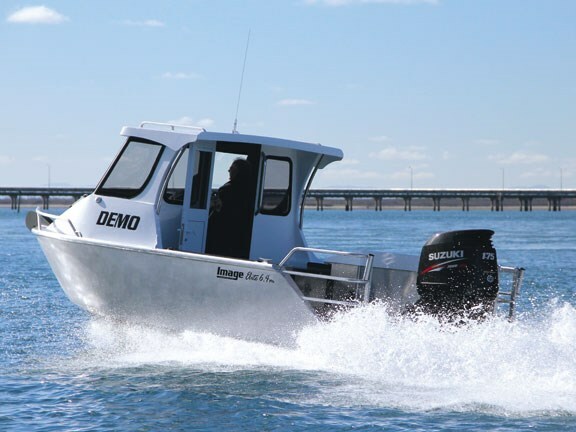 As a demonstration model the boat was also lightly equipped in terms of electronics, sporting only a single Garmin engine management display and a flush-mounted VHF radio. That said there is little room for flush mounting a fishfinder or multi display GPS plotter. These items would have to be fitted onto the dash and angled back towards the helm. The Image 6.4 Elite is a solid no-frills boat optimised for fishing. It achieves its primary purpose very well with its unique boarding platform, but without under-floor storage you'll need to carry a chilly bin for your bait and catch. Surprisingly, there's no live bait tank fitted to the boat as standard but this again is offered as an option. Wilkes has deliberately kept the spec of this boat to a bare minimum. That's reflected in an entry-level price of just over $71k on trailer, with a smaller but adequate Suzuki DF 115 four-stroke. Optional extras included on the boat are hydraulic steering, hardtop paint and Nyalic protection on the topsides. 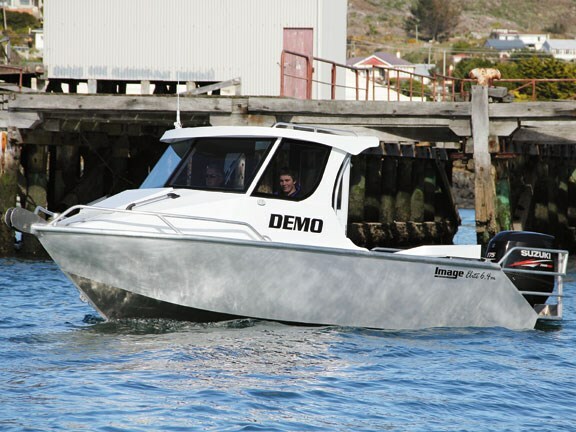 For more information email dean@imageboats.co.nz or check out imageboats.co.nz.